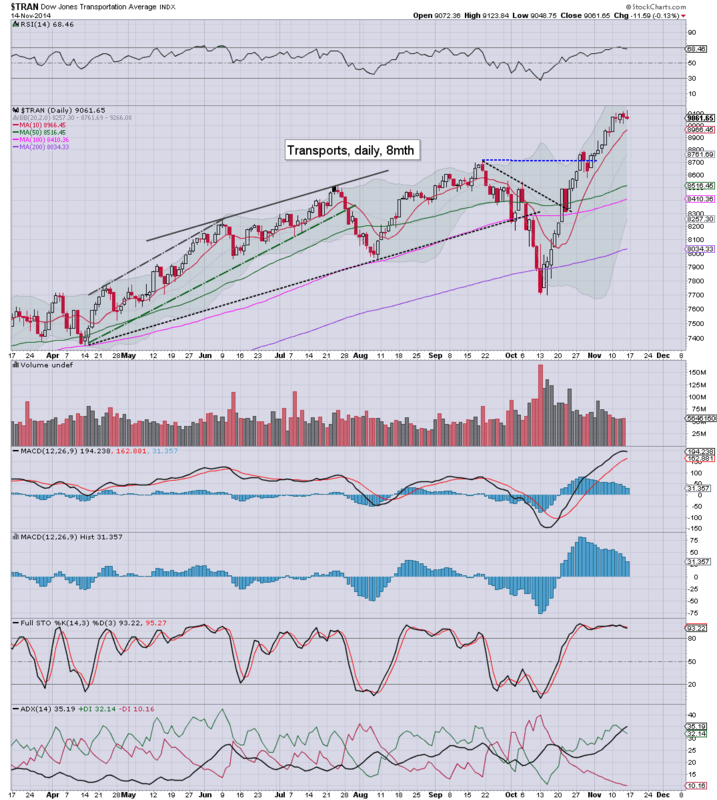 US equity indexes continue to broadly climb, with a trio of new historic highs in the Dow (17705), Trans (9123), and Sp'500 (2046). 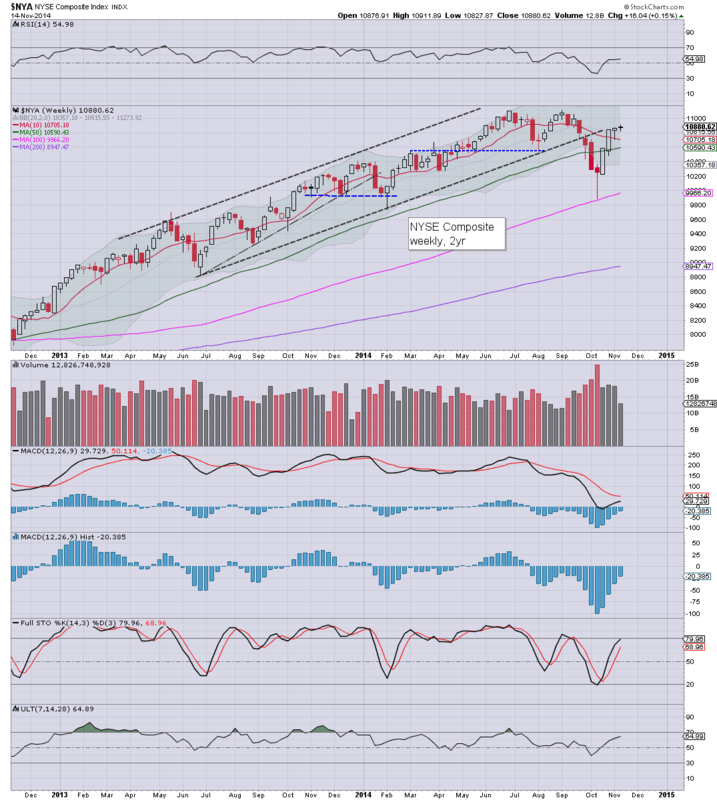 A moderate retrace of 2-4% seems viable, before the resuming upward into year end. Upper bollinger will be in the 2055/60 zone next week, and there remains threat the market will jump higher on some nonsensical excuse. On balance though, a moderate retrace looks due before end year. Primary downside target zone is 1980/50. A break under 1900 looks effectively impossible for many months. The tech is powering higher, with a rather sig' gain of 1.2%, on its way to challenge the March'2009 high of 5132... which looks set to be hit by late spring 2015. The mighty Dow gained just 0.35%, having hit a new historic high of 17705. Even if there is a retrace in the coming few weeks, a break back below the 17k level looks out of range. 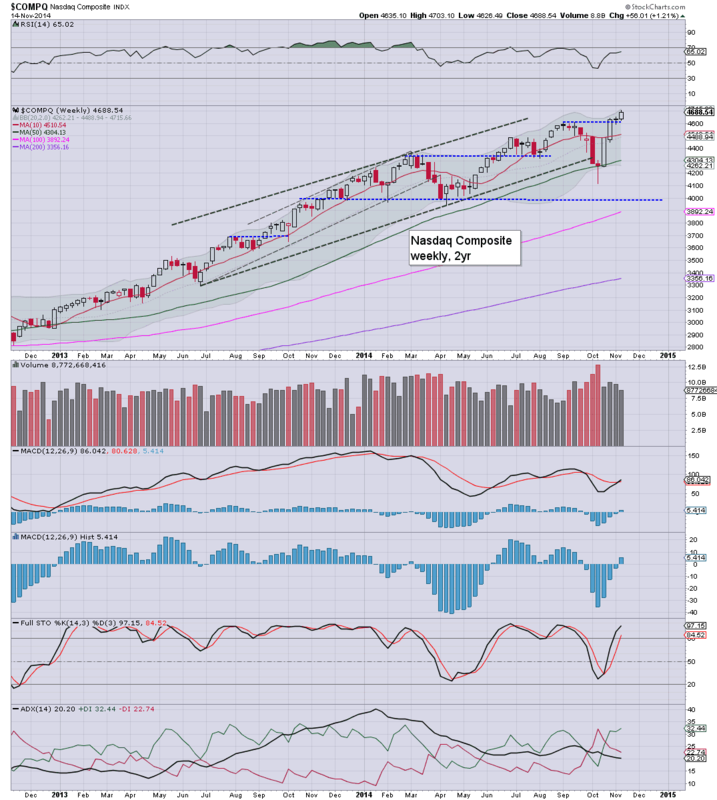 Dow 18k now looks an easy target within the next month or two.. and frankly, if you can accept 18k as likely... why not 20k by next spring/early summer? The master index only managed a fractional gain of 0.15% this past week, with underlying price momentum still moderately negative. 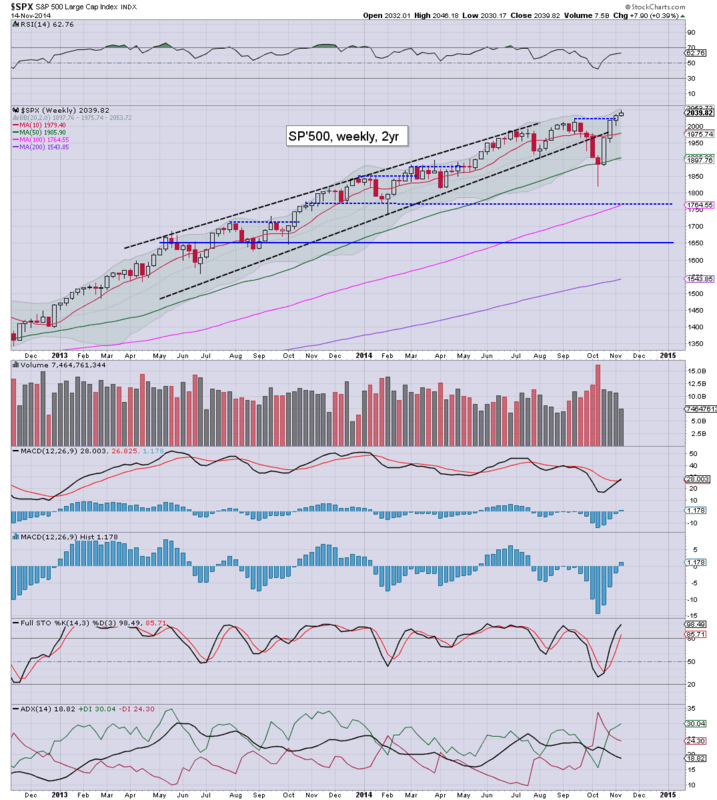 Regardless of any near term retrace, a year end close in the 11000s looks very likely. The second market leader settled effectively flat this week at 1173, having broken a cycle high of 1188. Those equity bulls seeking broader market upside for another few quarters are going to need the R2K to break the double top of 1212/13 within the next few months. 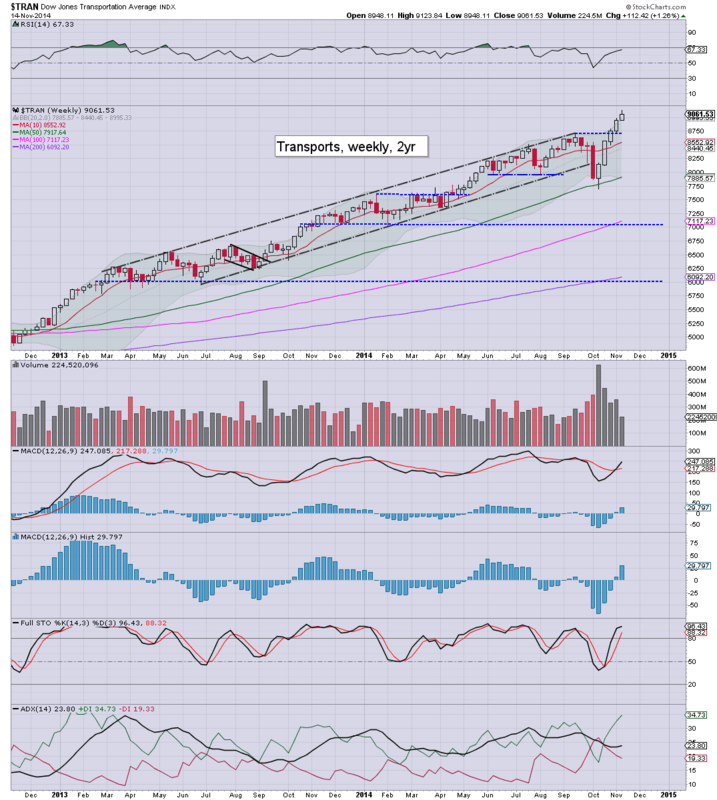 In many ways, price action for the R2K this year is very much like the Transports across 2012. The 'old leaders' gained a significant 1.2% this week, having broken into the 9100s. Any retrace will not likely go much below the 8700s. Trans is unquestionably seeing extra strength because of the broadly weak energy prices. 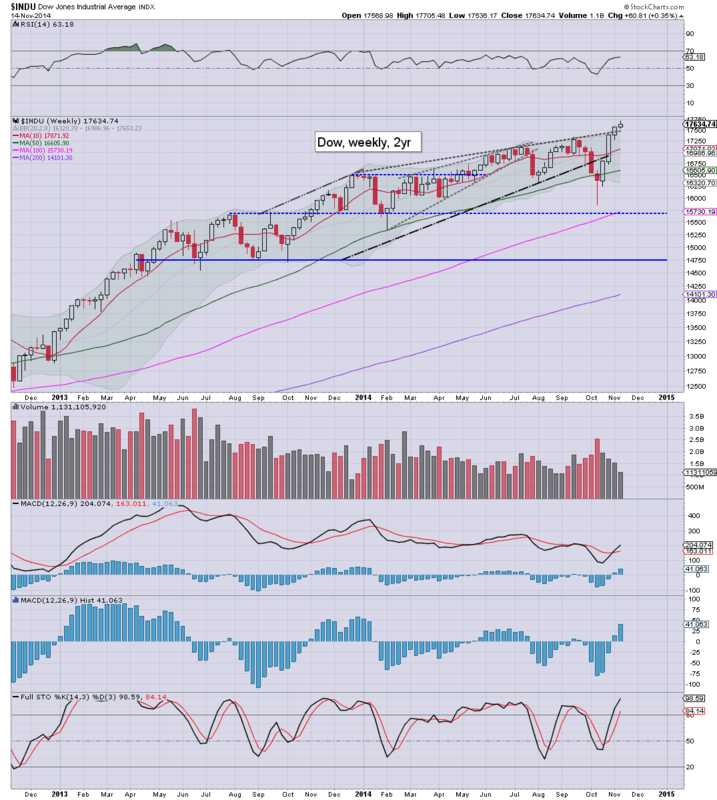 So.. a fourth consecutive net weekly gain for all of the six main indexes. Sure, some of the gains were very minor, but with new historic highs in the Dow, Trans, and sp'500, it was unquestionably another week for the bulls. On any basis, there is a very viable retrace due across the second half of November, but downside looks very limited, 3-4%.. at most. In terms of VIX, sp'1950 might 'briefly' equate to the 18/20 zone, before melting lower into year end. There are a sprinkling of bits and pieces lined up for next week... arguably, the Fed minutes will be the highlight. 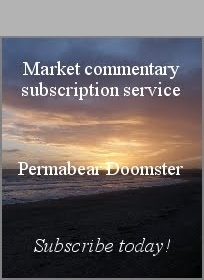 Mr Market will no doubt want to be reassured that int' rates will remain low for much of 2015. Fri -... other than opex.... nothing is scheduled. It was a rather tedious week in market land... with a tight trading range of sp'2046/30.. a mere 0.7%. With a trio of new index highs, the bulls remain in full control, and look set to broadly continue climbing into early next year. The fourth consecutive green candle on the sp'500 'rainbow' chart. Unquestionably... the immediate trend is outright bullish. 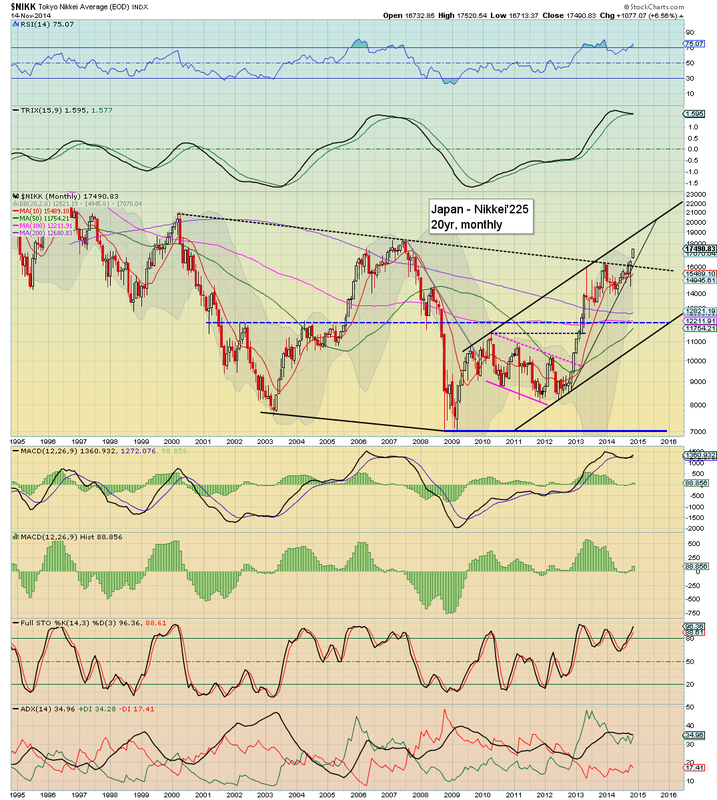 First support is the 10MA.. around sp'1980... itself rising each day. As for next week and the rest of November, a small equity retrace STILL looks due... but at best ... probably levelling out in the 1980/50 zone. 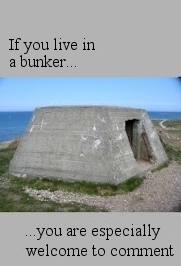 All hopes of sub'1900s are surely gone. With energy prices remaining broadly weak, the Russian equity market remains at 5 year lows. I realise a fair few of you will have ZERO interest in the Russia market, but still, I think its kinda interesting to be mindful of. With the recent break under the giant 1000 threshold, next major support is around 800. 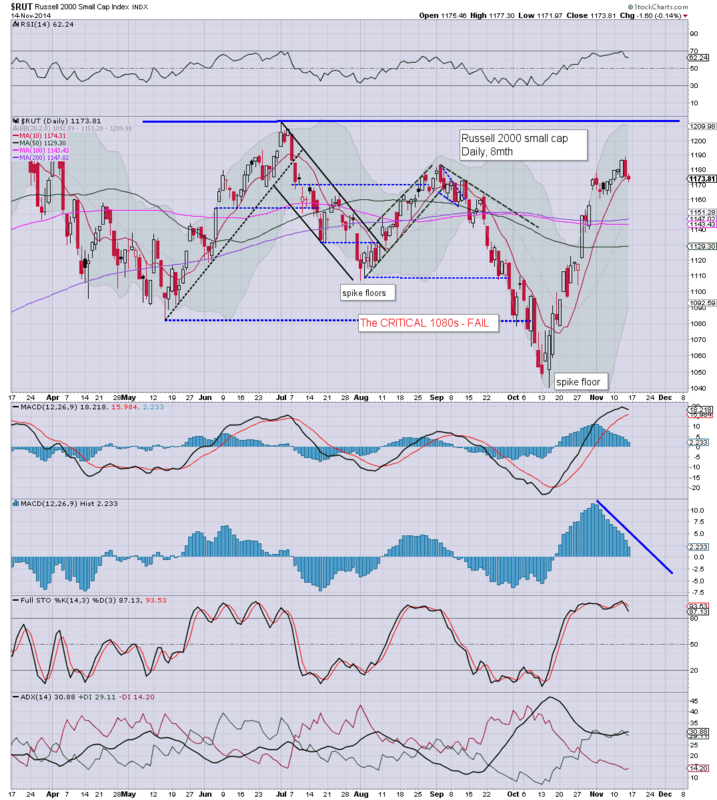 The giant 20k level is a very valid target for the Nikkei by mid 2015... if not sooner. US equities settled the week with some mixed chop, sp' +0.5pts @ 2039. The two leaders - Trans/R2K, both settled lower by -0.1%. 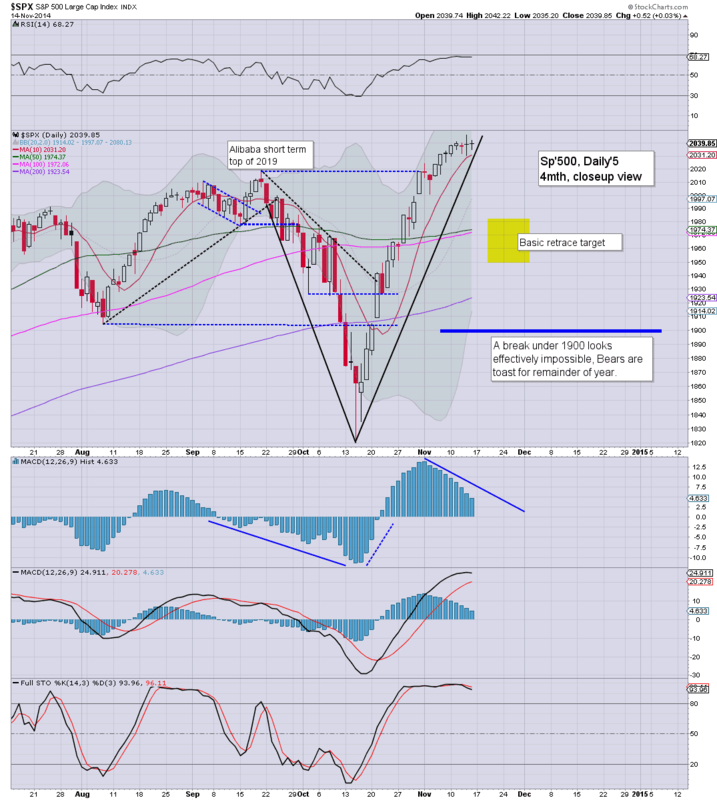 Near term outlook continues to offer a retrace, but then.. that has been the case for the last two weeks. 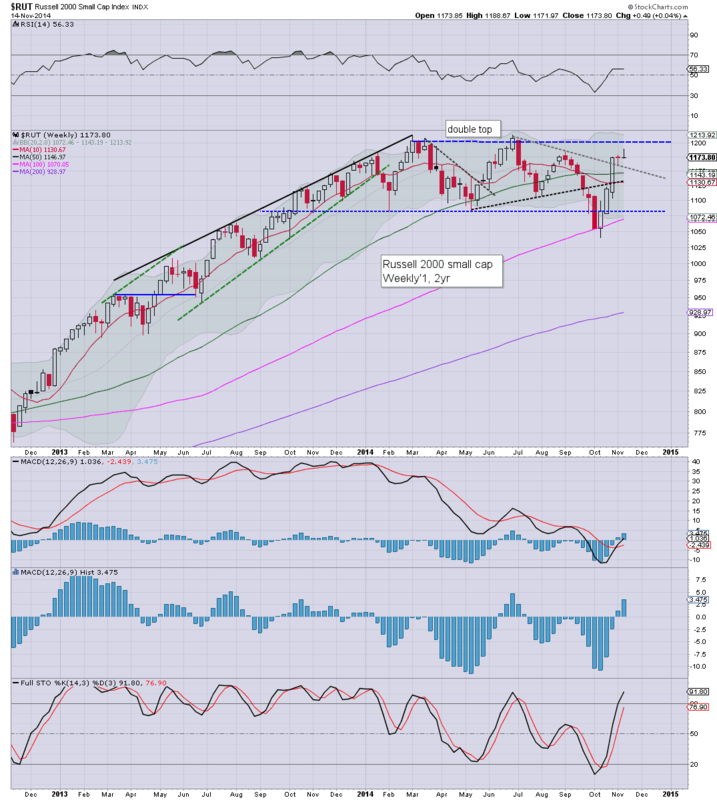 *it is notable that the R2K has broken the daily 10MA.. with the MACD (blue bar histogram) cycle set to turn negative at the Monday open. 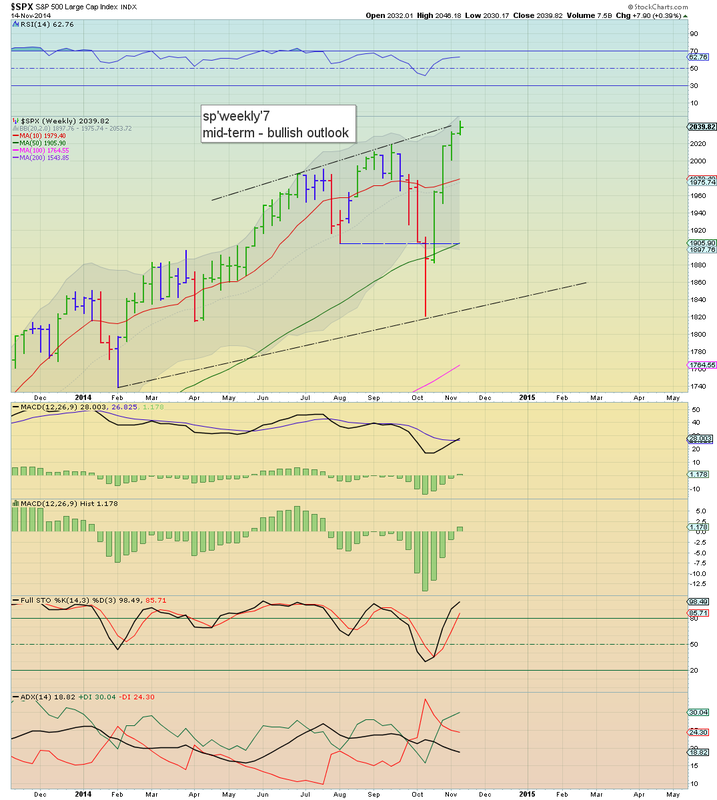 All of the US indexes look tired in the near term, although were breaking new highs as recently as Thursday. 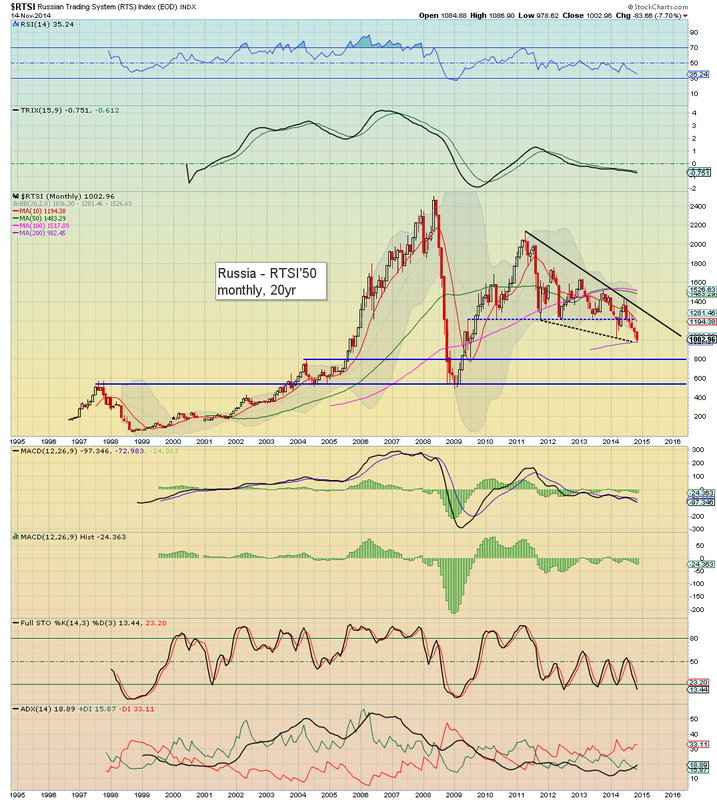 At best, a retrace to sp'1980/50 zone.. before further upside into year end.